Ventriloquists can utter entire phrases while their lips remain still. Their second voice doesn’t appear to come from the usual parts of the body you would expect it to come from, yet it is there. So, when I first saw Jeff Dunham perform, I joked to my colleagues “This guy must have two soundcards”. The two-soundcard metaphor is an amusing one. In reality, though, ventriloquists don’t have the ability to use their two voices at the same time, whereas some systems can play music over one soundcard while using a different device for monitoring. You may be interested to know that Chronotron also allows you to select which playback device to use, provided that your PC has multiple soundcards. This comes in handy, for example, if you need to switch often between your headphones and your main boxes. You could enable this behavior in previous versions of the app by turning on the option Use alternative playback engine. The good news is that, starting from Release 103, the new playback engine is now the default one so device switching is readily accessible. No additional tweaking needed. Click on the speaker button at the left of the transport controls, as shown above, then select the device you want to use out of the popup menu. And that’s basically all there’s to it. Just like ventriloquists do, the app can switch from one soundcard to another, even during playback (as of this writing, only one device can be active at the time). Does your system have multiple soundcards? Are there other scenarios you would like to see implemented in Chronotron? Let me know via the Comments section or through the usual support channels. How Old are You, Windows User? A friend of mine asked me recently why Chronotron is a Windows-only app. This is not an infrequently – nor unfrequently – asked question. Chronotron is a media player app whose design language is clearly touch-oriented. Music apps have been the realm of Macs for as long as I can remember, and today most touch-enabled apps run on Android or iOS. So why Windows? The answer has of course a lot to do with the app history and the developer’s experience with that platform, but not only. The typical Windows desktop/laptop/tablet hardware configuration is capable of doing pretty serious number crunching, and that’s the kind of power needed to perform time-stretching in real time at DAW quality levels. And when it comes to user experience, Windows has a nice UI and supports a myriad of input methods, including touch. However, my friend’s question is motivated by a growing concern out there: does Windows have a future in the consumer space? Before going any further, let me tell you that I’m by no means an aspiring OS market analyst. This post is based only on my personal observations and experiences as an app developer. A lot has been written elsewhere about Microsoft becoming the new IBM, so it seems that future Windows relevance to end users is indeed a subject. There’s certainly more to it than tech news clickbait: I keep hearing stories from colleagues, friends and relatives about companies relegating Windows to the data center – or to the cloud – and running their few remaining desktop apps virtualized. I have noticed myself that some enterprise software, which used to rely on fat clients, have become browser-based in their newer releases and therefore less dependent on the client OS. Some go as far as saying that “Windows is done” when it comes to end-user computing, though in my opinion this is largely exaggerated. 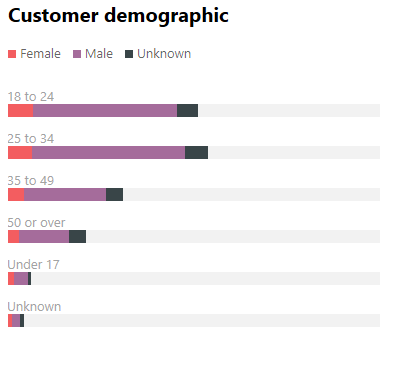 However, there’s something that worries me a bit going forward as an app developer: user age demographics. The total number of samples over the selected period is a four-digit figure (niche app obliges), but I have seen election polls conducted with less samples than that. Also, we’re talking here about paid software which most would classify under Productivity Tools rather than under Time-Wasters. It has no “social features” and no “engagement notifications”, though it does support stuff like touch, the Surface Dial and – scoop, scoop! – soon speech. Still, one could assume that the elders would be more likely to stay with a previous version of Windows – therefore not having access to Store apps – so younger age groups would get a boost in the stats, or in any case appear less dim. Such simplistic interpretation might be wrong. Actually, I hope I’m wrong. But what about Microsoft’s vision and message? The push to get desktop apps to the Microsoft Store is a good move, though I doubt it will help rejuvenating the Windows user base. On the other hand, the Dev Center Benefits website – a rewards program for app developers – hasn’t been updated since almost one year ago. So yes, Microsoft could work harder on telling us developers what their vision for the consumer market is. Time will tell if Windows will succeed as an app ecosystem. At the moment I have no plans to port Chronotron to other platforms because, as a Windows developer, I want to believe. And I love you, dear user, the way you are. I’ll share some more data with you, at the risk of adding fuel to the fire that my original post started. 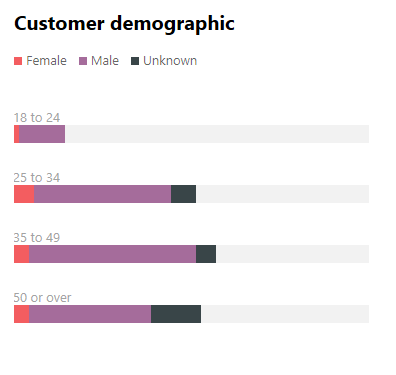 Below is the age demographics of Chronotron Mobile, a free version of Chronotron that ran on Windows Phone 8.1. The app lived from Nov 2014 to Nov 2016. We all know purchasing power matters. However, the above chart is closer to what I expected from a platform having a reasonable share of younger users (Windows Phone 8.1 in this case).